This lovely Dresden Plate quilt was a wedding present for my parents, Lawson and Mabel Sowell, in 1931. It was pieced, appliqued, and quilted by hand with great care and skill by Lawson's sister, Lemma Sowell Lucas in Madison County, Texas. The 18-20 fabrics used in the quilt are representative of the variety of fabrics from the Depression Era years. 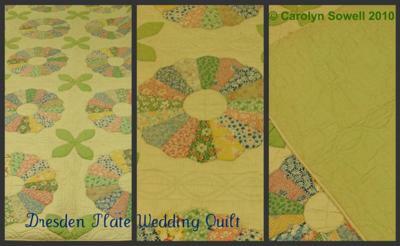 Each of the 20 blocks has 16 gores pieced together to form the circular shape which is appliqued to the block. The blocks are set side by side, and where the blocks join, a four-leaf design is appliqued. The quilt is somewhat unique because of the "donut-like" opening in the center of each "plate." Join in and write your own page! It's easy to do. How? Simply click here to return to Share Your Heirloom Quilts. Copyright ⓒ 2009-2017 Quilting-in-America All rights reserved.